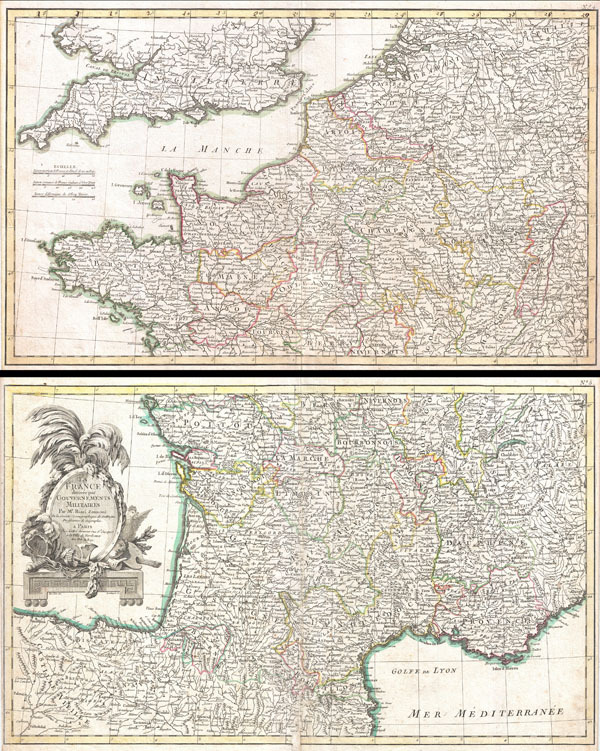 A beautiful example of Zannoni's 1775 decorative two panel map of France. Lower sheet covers from Valladolid, Spain, eastwards as far as Piedmont and northwards as far s Navernois. Northern sheet covers from Bretagne eastward as far as Switzerland and north as far as the Hague. Includes the Channel Islands and the southern Part of England and Wales. A decorative title cartouche appears in the lower left quadrant of the southern plate. Drawn by Zannoni c. 1775 for issue as plate nos. 4-5 in Jean Lattre's 1776 issue of the Atlas Moderne. Very good condition. Original centerfold. Bottom sheet has some centerfold damate at bottom center.